In our first-year physics lab we have the following horticultural experiment. 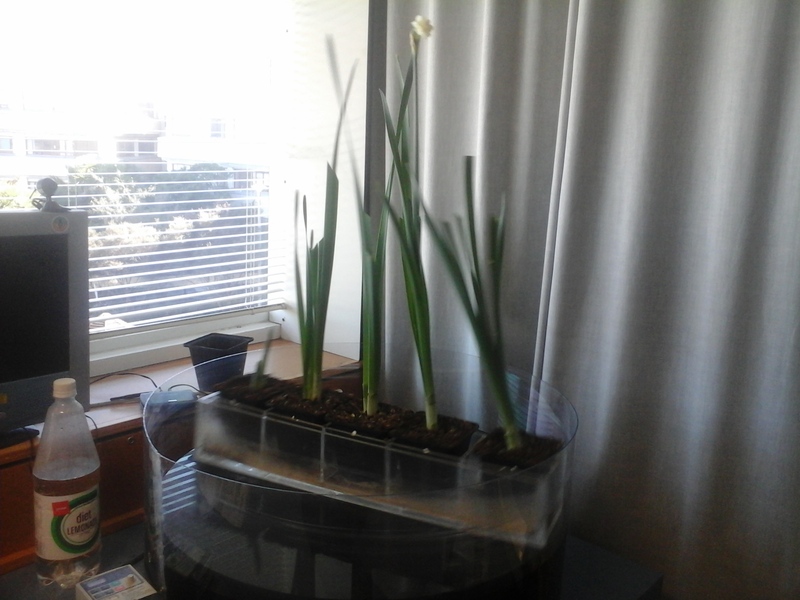 Here we have some bulbs growing on a rotating turntable. The array of five pots is placed on the turntable so that the centre pot is at the centre of the turntable; the left- and right-hand pots are at the perimeter.The turntable is rotating at about half-a-revolution a second. What happens as the plants grow? Actually, this is a demonstration of centrifugal force just as much as it is a horticultural experiment. First the biology bit. Plants grow, pretty-much, towards the light. I'm sure someone will tell me the mechanism by which this happens, but for now I'll just state that as true. In this case, however, what is towards the light is constantly changing. The plants get equally illuminated from all sides. So we can take light out of the equation. The other direction plants grow is upwards. What do we mean by 'up'. It's against gravity. Again, someone will tell me the mechanism by which they achieve this (rather than sending their shoots straight down into the ground). But what is 'up' when you're on a turntable. Imagine you're standing on the spinning turntable. To remain 'upright' you'd have to lean into the centre. Why? In the rotating frame of reference, the one you're in, you experience centrifugal force pushing you outwards. You need to counter-act that. The same is true for the rotating plants. They effectively experience gravity as being downwards and a little bit outwards. Consequently they grow upward and a little bit inwards. Note how the centripetal force is proportional to the radius at which the plants are growing, so the ones on the ends of the line have more of a lean than the ones in the centre. (Unfortunately the left-hand plant as we see it has been a bit slow-off-the-mark, but you can still clearly see the lean.) Indeed, the central plant, sitting on the axis of rotation, experiences no centrifugal force and it grows straight upward. We can get a little more mathematical. The turntable takes T=1.7 seconds to do one revolution (I've just gone and timed it) and the outer plants are about r=20 cm off the axis. This means the centrifugal acceleration is given by omega squared times r, where omega is the angular velocity (= 2 pi / T). Doing the calculation we then get a centrifugal acceleration of about 2.7 metres per second squared outward. Compare this with the acceleration due to gravity, which is about 9.8 metres per second squared downwards. It's about a quarter the strength of gravity. So, for every four centimetres the outer plant grows upwards, it should grow by one centimetre inwards. A glance at the image will tell you that seems to correspond with what actually happens. Finally, then, a challenge to those who say centrifugal force is just something that you think is happening when you go round a bend in your car – it's not a real thing. Plants don't have a brain. They aren't just thinking they are experiencing centrifugal force. They ARE experiencing centrifugal force.